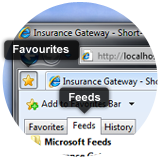 Please note the feeds below are for the Short-term Consumers Gateway only. Below is a sample of the RSS Feed for the Short-term Consumers Press Room. An underwriter whose business is confined solely to carrying on reinsurance business and the peripheral services offered by a reinsurer to its customers. This is as opposed to a primary insurer who exchanges reinsurance or operates a reinsurance department as an adjunct to its basic business of writing direct insurance business.